MOSCOW (Sputnik) - Russian Deputy Prime Minister Dmitri Rogozin has said that Russian President Vladimir Putin had signed the country’s new state arms procurement program, which includes, among other things, robotics, intelligence systems, UAVs and precision ammunition. “Yes, the document has been signed by the president,” Rogozin said in an interview with the Kommersant newspaper, when asked a relevant question. The deputy prime minister noted that the new program had been prepared based on the experience of use of weapons and military equipment in combat conditions in Syria. New platforms and systems have been tested during deployment in extreme conditions, he said. In total, more than 200 types of weapons and equipment were tested, he noted. “Robotics, intelligence systems, combat and reconnaissance UAVs, anti-missile aircraft defense, precision ammunition — all this is included in the new state arms procurement program. At the same time, one should not turn a blind eye to the build-up of NATO's military potential, the implementation of the global strike concept by the United States, the intention to deploy weapons in outer space, and the deployment of strategic non-nuclear systems of precision weapons. We will have a decent answer to all this, believe me,” Rogozin said. In November, Russian Deputy Defense Minister Tatiana Shevtsova said that the program stipulated spending 19 trillion rubles ($325 billion) on military equipment procurement and one trillion rubles ($17 billion) on synchronization system. 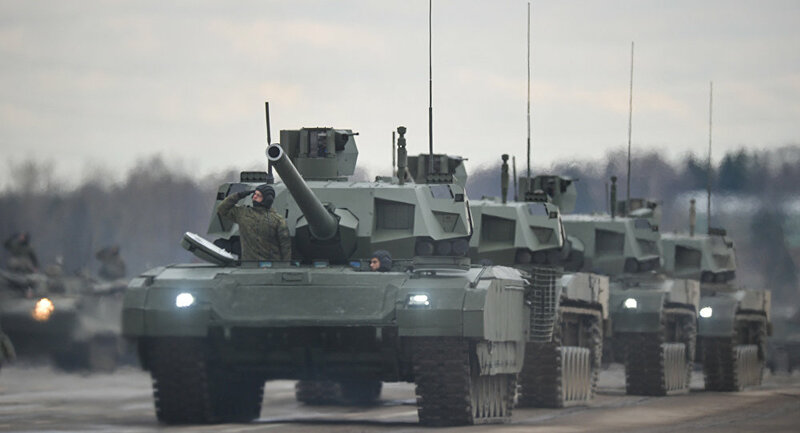 Previous year, a source at the Defense Ministry told Sputnik that the program, among other things, would include the S-500 air defense missile systems, the fifth-generation Su-57 fifth-generation fighter jets, Armata tanks and armoured vehicle. Dmitri Rogozin said that the share of modern equipment in service at the Russian Armed Forces will amount to 70% in 2021. The Deputy Prime Minister also noted that nearly 300 foreign-made weapons models have been replaced with Russian products since 2014, including 200 arms produced by the NATO and EU states and 100 models produced by Ukraine. “In total, since 2014 we have replaced Ukrainian products in more than 100 samples of armaments and military equipment, as regards the products of the NATO and EU countries – the number of weapons, for which the import substitution measures were planned and carried out, is even bigger — about 200. In 2017, there was no a single case of disruption of the fulfilment of the state defense order because of restrictions in the supply of foreign components, all these components were replaced by the Russian-made analogues,” Rogozin said. The task was not to simply copy foreign-made products, but to produce new and more advanced arms, he noted.